Winter's Fern is worked from the bottom-up in the round with a striped brim and colorwork in the body. 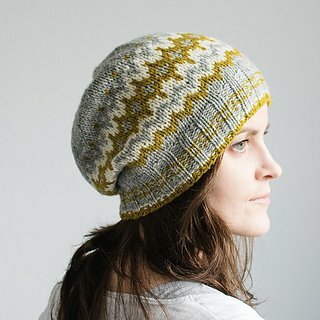 This hat knits up quickly and is perfect for an adventurous beginner in Fair Isle knitting. Skill Level: Knitting in the round, decreases and increases, reading charts. 4mm (US6) 16" circular for the brim, 4.5mm (US7) 16" circular for the body. If you prefer magic loop go with a longer circular needles. 30 Stitch markers for chart repeats. Homework: Instructions come in two styles: Beanie and Slouchy hat. Cast on and complete the ribbed brim prior to the start of class. This will allow the 2 hour class to focus on the colorwork portion of the pattern.